Not to be confused with Luminance. In photometry, illuminance is the total luminous flux incident on a surface, per unit area. It is a measure of how much the incident light illuminates the surface, wavelength-weighted by the luminosity function to correlate with human brightness perception. Similarly, luminous emittance is the luminous flux per unit area emitted from a surface. Luminous emittance is also known as luminous exitance. Illuminance diagram with units and terminology. In SI derived units these are measured in lux (lx), or equivalently in lumens per square metre (cd·sr·m−2). In the CGS system, the unit of illuminance is the phot, which is equal to 10000 lux. The foot-candle is a non-metric unit of illuminance that is used in photography. Illuminance was formerly often called brightness, but this leads to confusion with other uses of the word, such as to mean luminance. "Brightness" should never be used for quantitative description, but only for nonquantitative references to physiological sensations and perceptions of light. The human eye is capable of seeing somewhat more than a 2 trillion-fold range: The presence of white objects is somewhat discernible under starlight, at 6995500000000000000♠5×10−5 lux, while at the bright end, it is possible to read large text at 108 lux, or about 1000 times that of direct sunlight, although this can be very uncomfortable and cause long-lasting afterimages. 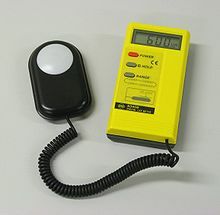 ^ "Measuring Light Levels". Autodesk Design Academy. Archived from the original on January 12, 2015. Retrieved Nov 16, 2017. ^ Schlyter, Paul. "Radiometry and photmetry in astronomy FAQ, section 7". ^ "Formulae for converting to and from astronomy-relevant units" (PDF). Retrieved Nov 23, 2013. Kodak's guide to Estimating Luminance and Illuminance using a camera's exposure meter. Also available in PDF form.